Halloween attractions are everywhere in Southern California during this season, so it can be difficult to weed out the worthwhile examples from those that more skippable. It’s even more difficult when just about every offering one visits during a given year is at the very least worthy of a visit. Such is the case with 2017. This past weekend I was given the opportunity to visit “Into the Black,” an all-new Halloween maze put together by makeup and special effects artist Larry Bones (most famous for his work on the crime drama TV series “Bones,” appropriately enough) in the city of Pomona. Into the Black is unique in that it returns the concept of Halloween mazes to its origin– scary monsters in a scary location. But beyond far-above-average production design and extremely impressive costuming, what makes this maze so effective is that each guest must go through alone. The team at Into the Black spaces out participant entries into the maze by every few minutes, meaning that each and every person that enters the labyrinthine abandoned home of the Black family does so completely by themselves. There’s no one in front of you, there’s no one behind you. It’s just you and the demonic creatures lurking in the dark. Great care and attention to detail was put into the set decoration of the Black home. All the furniture is aged, the wallpaper torn and peeling, and cobwebs are strewn about in every corner. But the sounds are really what get you– moaning coming from ahead, footsteps following from behind. It seems that anywhere you turn there is something out to get you, to the point where it can be frightening even turning a corner. Also available is a virtual reality experience that wasn’t quite as memorable as the perfectly-executed maze itself. While it’s nice to see Halloween experiences experimenting with new forms of storytelling, sometimes the traditional ways of doing things are the most powerful. 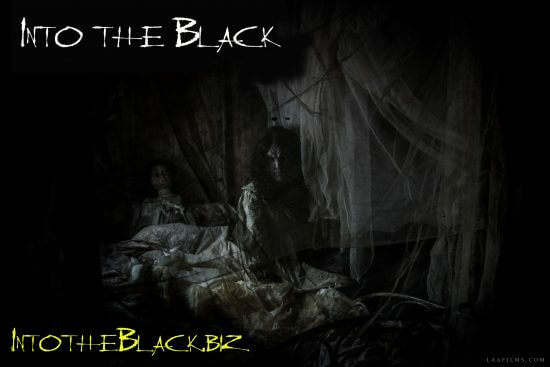 The team behind “Into the Black” also put together a 25-minute short film prologue to the maze, which sets up the story nicely and prepares guests for what they can expect when they step through the doors of the Black mansion. “Into the Black” runs on select dates from now through Halloween at the Pomona Fairplex in Pomona, California. Be sure to visit the event’s official website for more information.